Based on the old Wide Range Humbucker trick where the 6 hidden threaded rod magnets are removed to give a clear, hum-cancelling, fat single-coil sound. The difference with my 'Domino' pickups is that I've designed them to fit a standard Gibson/PAF/Humbucker size, so you can have true hum-cancelling, noise-free single coil pickups voiced that will fit any standard humbucker mounting ring and cavity. Overwound to hotter specs than my regular Domino, The Creamery 'Dark Star' is a hotter, darker, warmer hum-cancelling pickup with a unique fuller, much fatter, darker and higher output sound while still retaining much of that vintage single coil clarity. I've really designed it for those who want more warmth and a darker sound from their bridge position in a hum-cancelling design - Great for H-S-S Strat players who want to keep more of a single coil sound in the bridge, just fatter, fuller, less brittle. With Alnico 2 magnets the overall sound is warmer, slightly more resonant whereas with the slightly stronger Alnico 5 the overall sound is a little brighter, more attacking, more focussed with more punch - both with classic single coil sounds in a replacement humbucker size, hum-cancelling pickup. A great pickup if you're after a noise-free, humbucker sized single coil sound with a much darker, warmer voice. 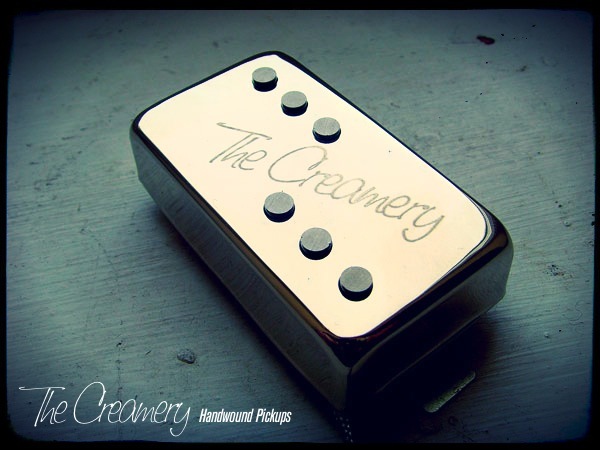 You can find more details of my Creamery Custom Shop Handwound Replacement 'Domino' Split-Coil Humbucker Sized Single Coil Pickups here.